I. Lindisfarne Abbey 793 AD. In spite of my long-standing relationship with progressive rock, I have never been a huge proponent of concept albums or rock operas. With few exceptions, these ventures are often underwhelming, resulting in overambitious pastiches that do no favours to the career or reputation of any act. 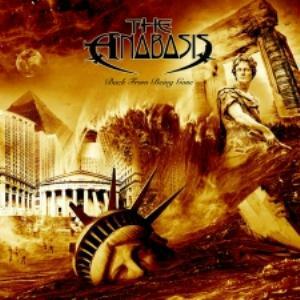 For this and other reasons, I could not help approaching The Anabasis’ debut album, Back From Being Gone, with a feeling of trepidation. Born in 2009 from the collaboration (and personal friendship) between two New England residents – multi-instrumentalist and composer Barry Thompson and professional writer George Andrade – The Anabasis is a project that was conducted and developed almost completely over the Internet. Though neither Thompson nor Andrade may be household names for the majority of prog fans, their extensive network of contacts on the international scene has helped them to gather a sterling team for the realization of their debut album. While the presence of keyboardist extraordinaire Ryo Okumoto (of Spock’s Beard and K2 fame) – as well as the support of 10T Records, one of the leading independent labels on the current scene – is the most likely to attract the average prog fan, the other musicians on board are all equally talented, though perhaps not as well-known. The Anabasis’ very name rings familiar to those who, like me and many of my contemporaries, have got years of classical studies under their belt. Meaning “advance”, it is mostly known as the title of Greek historian Xenophon’s most renowned work, concerning the feats of Persian prince Cyrus the Younger and his army of ten thousand Greek mercenaries. Though Back From Being Gone bears no direct relation to Xenophon’s work, the connection with ancient history is very much in evidence on the album –right from the lush imagery contained in the stylish, very thorough booklet. The artwork superimposes Roman architecture and sculpture, Egyptian pyramids and Viking swords with computers and other trappings of modernity, and the striking cover suggests that our own very advanced civilization may soon go the same way as its predecessors. For an album entirely recorded over the Internet, Back From Being Gone is a surprisingly cohesive, organic-sounding effort. While the three epics follow very much the traditional, multi-part template, employing a recurring leitmotiv (both musical and lyrical) to emphasize the fil rouge running through them, the three free-standing songs, though obviously connected by topic, are quite distinct from each other in musical terms. “Fly”, with its sprightly, dance-like pace and bright guitar/synth alternation, is followed by the melodic yet riff-heavy texture of “Carpe Diem”; while the dramatic “Epiphany” veers sharply into metal territory, propelled by Gerald Mulligan’s acrobatic drumming and slashed by sharp guitar and whistling synth, Gordon Tittsworth’s ominous growl providing a perfect foil to Pellek Åsly’s melodic, well-modulated high tenor. At 14 minutes, “Rome” is the shortest of the epic pieces, and also the most cohesive, with a haunting, Middle Eastern-influenced theme developed slowly but steadily by violin, guitar and Okumoto’s tapestry of keyboards – including the unmistakable rumble of the Hammond organ. A series of quotes from ancient and modern historical characters (from Julius Caesar to George W. Bush) anchor the lyrical content to present times, providing ample food for thought; the grandiosity of the piece, appropriate to its topic, never descends into mere pretentiousness, and the instrumental interplay always keeps melody at the forefront. “Vikings”, introduced by Gregorian chant and a narrating voice, takes on a darker, more aggressive tone – culminating with a dramatized account of the attack on a village in Mercia underscored by tense, cinematic riffs and crashing drums. Guest guitarists Plini and Christopher James Harrison contribute blistering fretwork, complementing Pellek’s passionate vocal performance. “Egypt”., at almost 24 minutes, is the longest and most ambitious number on the album, and, in my view, also the one that would have benefited from some editing (especially as regards the last part, catchy and upbeat but also a bit run-of-the-mill). Not surprisingly, it reprises the Eastern influences of “Rome”, though in a heavier key, with plenty of riffing and dramatic tempo changes; guest guitarists Josh Sager and Stefan Artwin (of German outfit Relocator) provide solos that range from shreddy, almost discordant to slow and melodic, with echoes of Pink Floyd’s David Gilmour. Clocking in at about 74 minutes, Back From Being Gone is a long album, even for today’s standards. As clearly illustrated in the previous paragraphs, it also possesses a solidly traditional vibe that might put off those looking for more left-field listening material. It is, however, a lovingly-crafted effort, full of genuine warmth and enthusiasm, as well as outstanding musicianship – and a cut above the rest in terms of lyrical content, which is genuinely thought-provoking and accurately researched without being overly pretentious. Even if I am generally oriented towards more challenging stuff, I found Back From Being Gone a very enjoyable listen, and I cannot but applaud the effort and vision behind it. It is a pity that we will probably never be able to see this work performed on stage… Then again, who knows?